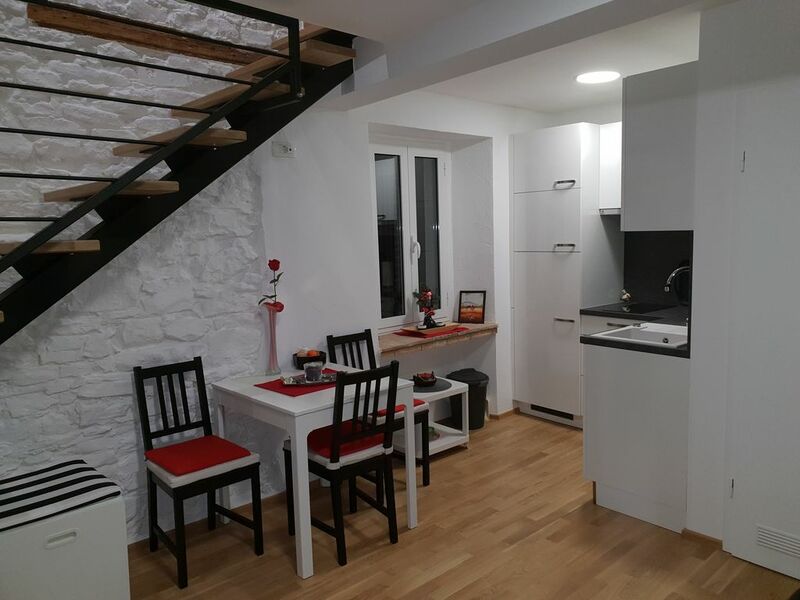 The apartment is completely renovated and decorated in a completely renovated old stone house in the old part of Izola. The apartment is duplex, arranged on two floors with internal stairs. In the lower part of the duplex apartment there is a completely new kitchen with a dishwasher. The bathroom is equipped with washing machine. In the lower part of the apartment is a sofa with a pull-out bed of 140x200 cm. In the upper floor led internal wooden steps. On the first floor is a double bed 160x200 cm and a bed for one person 80x200 cm. The apartment can accommodate 5 people. The entire apartment is air-conditioned and heated. Free Wi-Fi internet is available at high speed and works all over the apartment. On both floors there is a flat-screen TV with cable channels. The apartment is not suitable for disabled people. The apartment is family run. Management is followed by a sustainable principle using natural materials. The apartment is decorated in a stone old Istrian house, where natural local materials were used for renovation. As hosts, we want primarily peaceful and nature-bound guests who want to enjoy the beauty of nature and gastronomic local food and beverage. As hosts, we will do our best to make our guests enjoy Izola and the apartment and be happy to return. The accommodation can arranged transport to travel around the country or organizing excursions along the beautiful Istrian region. We also offer locally grown olive oil from our own olive grove. We can also arrange the purchase of home-made wine according to the intergrated production method.